Donald Trump’s rhetoric and policies targeting vulnerable populations present moments of political opportunity for the radical right, according to Mark Potok, senior fellow at the SPLC. “The alt-right is rebranding White supremacy for public relations, dressing up Ku Klux Klan ideas in suits and ties rather than robes,” Potok said on a press call. Four new groups, including Identity Evropa, American Vanguard, The Right Stuff and The Daily Stormer, were created or became more active since Trump ran for office. The rise in anti-Muslim groups is not altogether surprising given the broader, long-standing climate of targeting Muslim communities in America. For example, the FBI found that anti-Muslim hate incidents had risen by 67 percent in 2015. In the wake of the presidential election, the SPLC documented 867 bias-related incidents during the first 10 days after the election, many of which targeted immigrants or Muslims. These findings mirror the grave concerns of groups that monitor hate crimes and xenophobic rhetoric targeting Muslim, Arab and South Asian communities, including the Council on American-Islamic Relations, Muslim Advocates and South Asian Americans Leading Together. Which groups operate in your state? 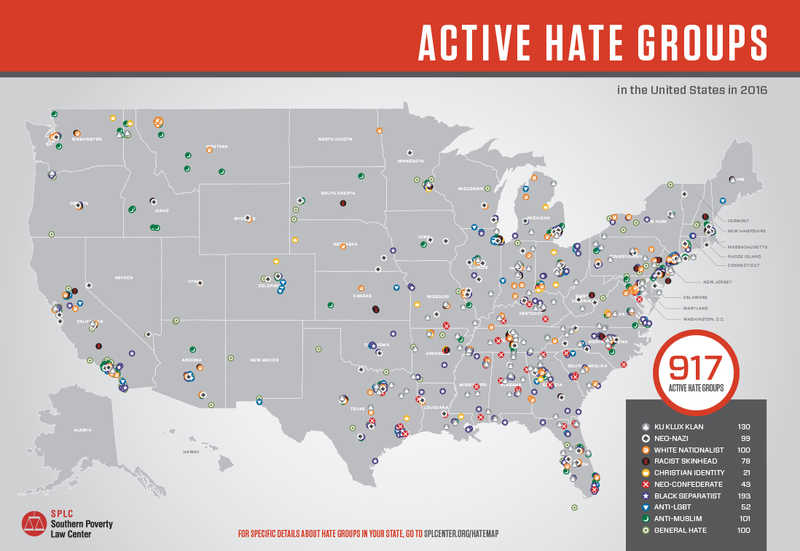 Check out the interactive SPLC Hate Map here.